Among The Costs Of War: Billions A Year In A.C.? The figure comes from a former Pentagon official who now sells energy-efficient technology to the Department of Defense. And it highlights the nuances of U.S. war spending. Among The Costs Of War: Billions A Year In A.C.? 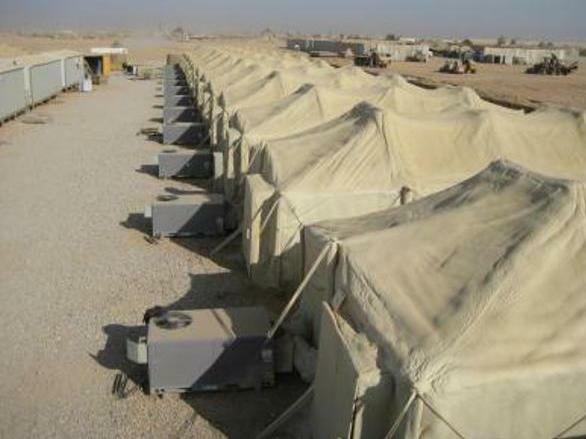 Air conditioners keep tents cool on a U.S. military base in Iraq. The tents have been treated with polyurethane foam to increase energy efficiency. The amount the U.S. military spends annually on air conditioning in Iraq and Afghanistan: $20.2 billion, according to a former Pentagon official. That's more than NASA's budget. It's more than BP has paid so far for damage from the Gulf oil spill. It's what the G-8 has pledged to help foster new democracies in Egypt and Tunisia. "When you consider the cost to deliver the fuel to some of the most isolated places in the world — escorting, command and control, medevac support — when you throw all that infrastructure in, we're talking over $20 billion," Steven Anderson tells weekends on All Things Considered guest host Rachel Martin. He's a retired brigadier general who served as chief logistician for Gen. David Petraeus in Iraq. He's now in the private sector, selling technologies branded as energy-efficient to the Defense Department. Now it's important to note that wrapped up in Anderson's $20 billion figure are all kind of other expenditures – for instance, the cost of building and maintaining roads in Afghanistan, securing those roads, managing the security operations for those roads. That all costs a lot of money and is part of the overall war effort in Afghanistan. The Pentagon rejects Anderson's estimate. Still his claims raise questions about how much the US footprint in Afghanistan really costs – especially something like air conditioning. To power an air conditioner at a remote outpost in landlocked Afghanistan, a gallon of fuel has to be shipped into Karachi, Pakistan, then driven 800 miles over 18 days to Afghanistan on roads that are sometimes little more than "improved goat trails," Anderson says. "And you've got risks that are associated with moving the fuel almost every mile of the way." Anderson calculates that more than 1,000 troops have died in fuel convoys, which remain prime targets for attack. Freestanding tents equipped with air conditioners in 125-degree heat require a lot of fuel. By making those structures more efficient, Anderson says, the military could save lives and dollars. Still, his $20.2 billion figure raises stark questions about the ongoing war in Afghanistan. In the wake of President Obama's announcement this past week that 33,000 American troops will soon return home, how much money does the U.S. stand to save? When you have this many people in a country that doesn't want you there — that has no economy, no infrastructure and a corrupt government — and you're trying to stabilize it and build them into a viable nation? I'm not sure we have enough time, and I definitely know we don't have enough money. The 33,000 troops who will return home by the end of next year match the numbers sent to Afghanistan in 2010, at a cost of about $30 billion. That comes out to about $1 million a soldier. But the savings of withdrawing those troops won't equal out, experts say. "What history has told us is that you don't see a proportional decrease in spending based on the number of troops when you draw them down," says Chris Hellman, a senior research analyst at the National Priorities Project. "In Afghanistan that's going to be particularly true because it's a very difficult and austere environment in which to operate," he says. That means most war expenditures lie not in the troops themselves but in the infrastructure that supports them — infrastructure that in some cases will remain in place long after troops are gone. "We're building big bases," American University professor Gordon Adams says, describing the money invested as, in economic terms, "sunk" costs. "We're seeing this in Iraq. We're turning over to the Iraqis — mostly either for a small penny or for free — the infrastructure that we built in Iraq. But we won't see back any money from that infrastructure." Then there's the costly task of training Afghan security forces. The Obama administration has requested almost $13 billion to train and equip Afghan security forces in the next fiscal year. And more importantly, Hellman says, "[Afghan President Hamid] Karzai indicated a couple years back that [Afghanistan] wasn't going to be a position to support their own military forces 15, 20 years out. I suspect we're going to be called on to pay a substantial part of that bill going forward." The realm of war and peace exists separately apart — and justifiably so — from the economic realm. For critics of the president, the idea that the troop drawdown won't save much money is reason enough to suggest it should be bigger. One outspoken critic is Sen. Joe Manchin (D-WV). He notes the wars in Afghanistan and Iraq have cost hundreds of billions of dollars so far, and he argues a larger troop drawdown isn't a national security risk. "We have the greatest special ops in the world. We have more technology than any other country on Earth," Manchin says. "Do we actually need to have 70,000 troops on the ground?" "When you have this many people in a country that doesn't want you there — that has no economy, no infrastructure and a corrupt government — and you're trying to stabilize it and build them into a viable nation? I'm not sure we have enough time, and I definitely know we don't have enough money," Manchin says. But others argue war should be waged independent of cost. 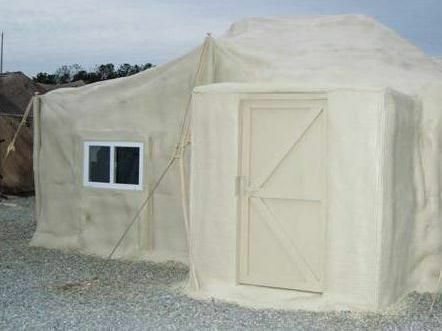 A U.S. military tent after treatment with polyurethane foam. A 2006 test of the foam cut energy use by 92 percent, says retired Brig. Gen. Steven Anderson. "The realm of war and peace exists separately apart — and justifiably so — from the economic realm," says Lawrence Kaplan, a visiting professor at the U.S. Army War College. He contends that critics like Manchin are looking for "economic answers to a non-economic question." "And anyway, it's not the war that's broken Washington's piggy bank," he adds, noting that Medicare, Medicaid and Social Security account for far more spending than the $107 billion the Pentagon says it will spend in Afghanistan next year. "Remember, we're talking about 30,000 troops," he says "I don't think that hundred-billion-dollar price tag should be the determining one." But for Anderson, the retired brigadier general, economics does have a role to play in modern warfare. Anderson advocates for increased energy efficiency for military structures to cut down on the need for long, dangerous fuel-transport missions. A few months ago, he says he heard from a company commander in Afghanistan. "He literally has to stop his combat operations for two days every two weeks so he can go back and get his fuel. And when he's gone, the enemy knows he's gone, and they go right back to where they were before. He has to start his counterinsurgency operations right back at square one." Anderson says experiments with spraying polyurethane foam insulation on tents in Iraq cut energy use by 92 percent and took 11,000 fuel trucks off the road. But he adds there's a lack of enthusiasm for a greener military among top commanders. "People look at it and say, 'It's not my lane. We don't need to tie the operational commanders' hands.' — things like this," he says. "A simple policy signed by the secretary of defense — a one- or two-page memo, saying we will no longer build anything other than energy-efficient structures in Iraq and Afghanistan — would have a profound impact." CLARIFICATION: The Pentagon disputes the calculation made by Anderson about air conditioning costs. Defense Department spokesman Dave Lapan says that in fiscal year 2010, the Pentagon spent approximately $15 billion on energy for all military operations around the world. The Pentagon says when it comes to Afghanistan, it spent $1.5 billion from October 2010 to May 2011 on fuel. That fuel was used for heating and air conditioning systems, but also for aircraft, unmanned aerial systems, combat vehicles, computers and electricity inside military structures. After this story aired and appeared on NPR.org, Lapan told NPR: "For our warfighters, the cost of fuel isn't the only price. They include the associated costs of moving and protecting fuel in combat. These costs aren't only in dollars — they can be measured in reduced mission effectiveness and in lives lost moving and protecting fuel around the battlefield. The volume of fuel US forces consume raises our risks and hampers our capabilities. Reducing the demand for energy can mean better range and endurance for our deployed forces."